The Stampin' Up! Tags For All set has been well loved and used this Christmas season. In particular, I pulled the stamps out to make about 50 tags for our school's annual Christmas Fair. Our year runs the charity cake stall, and we use these tags to help decorate the packaging of the cakes. I like to stamp for stamping sake, but I especially love to stamp for a purpose. In addition to the Tags for All stamp set, I also used various dies to cut out the tags, include the SU Sizzix Two Tags die. When my teen-age son was young, I often sent in goodie bags to his teachers at Christmas. Now that he's older, he wants to acknowledge his teachers without making too much of a fuss and losing that cool factor. He wanted to do more than a card, and we decided that hot cocoa packets with a decorative folded cover would be just the trick -- easy and discreet to carry into class, but something special and festive. These Cadbury cocoa pouches are available in twin packs, and when folded over, they tuck neatly into a card. The folded cards were made with 6-inch squares of designer cardstock. The cocoa packages are a half-inch thick, so the cards will need to be scored to accommodate the thickness. I scored the 6-inch square cardstock at 2 3/4 inches, and then I flipped the card and ran a parallel score at 2 3/4 inches again. A decorative strip was added to the sides of the card. While this dresses up the card, my primary reason for adding the strips was to make the card a bit longer to better hide the cocoa packet. You need two strips at 1 inch by 6 inches. Adhere these strips to the edges of the card. They will run parallel to the scored lines. Next, cut a strip of ribbon, 30 inches in length. Determine the middle, and center and glue the ribbon into position in the middle of one side of the folded card. Now you'll want to add your artwork on top of the ribbon. 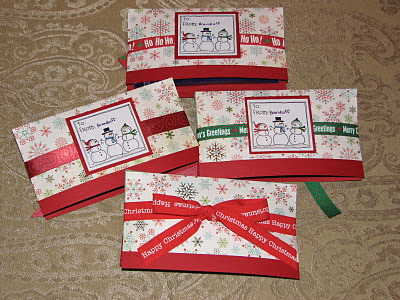 I've used Stampin' Up's Tags for All and colored the snowmen with markers. Obviously, you want the artwork to be small enough to fit on the folded card. Use a liberal amount of adhesive tape on the back of the artwork so that it helps to keep the ribbon in place. Tuck the cocoa packets into the folded card. You might want to use a small amount of snail adhesive or a mini glue dot to help keep the cocoa packet in place. Close the folded card, and tie the ribbon nicely in the back of the card. The pouches look sweet from either the front or back! Stockings are such a traditional part of Christmas. One of my fondest memories as a child is seeing the stockings hung on the fireplace mantel, and they would be filled with goodies on St. Nicholas' Day! This card harkens to those traditional times and features Stampin’ Up’s Sizzix Stocking Die. You can coordinate any of your favorite Christmas designer papers. This will be a card, so you need two pieces of the designer card stock run through the die. You will need to flip the design over when cutting the second stocking. If your chosen designer card stock is 'busy,' you should cut a white paper insert on the stocking die, too. Begin by adhering the heel and toe pieces onto the stockings. 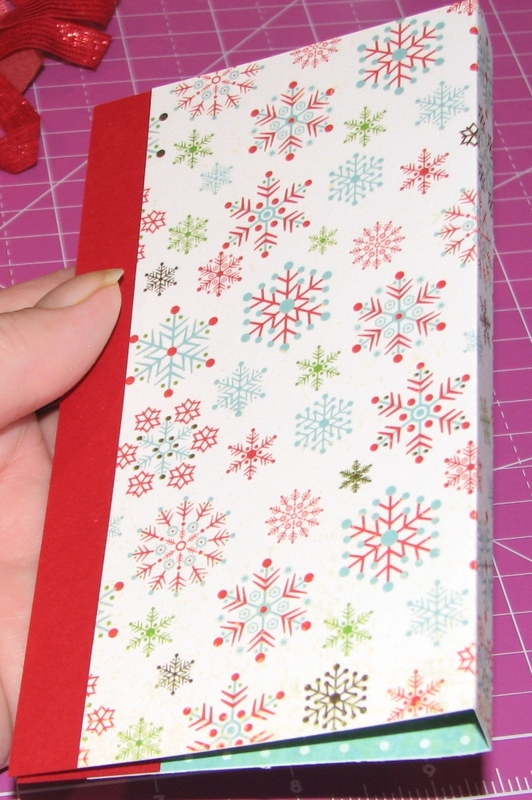 Second, adhere the white insert onto what will be the inside of the stocking. Third, add one of the tops to a stocking, which will then be your guide for the second sock. It’s important that the two socks line up. The stocking should not exceed 6 inches from toe to top (to fit in a 6 x 6 inch envelope). Fourth, add a small amount of glue along the very top of the inside of the stocking top, and stick the two pieces together. This will now work as a hinge for the card to open up. Create any kind of tag for the stocking. 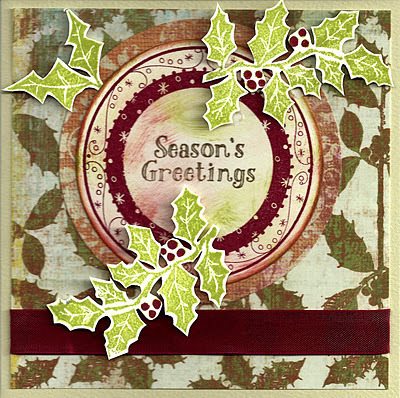 This sample uses a die cut label and two coordinated Stampin' Up oval punches. The sentiment is stamped in SU Bravo Burgundy ink and a stamp from SU Best Yet set. Punch two small holes in the top right corner of the stocking to insert and tie ribbon and adhered the tag. 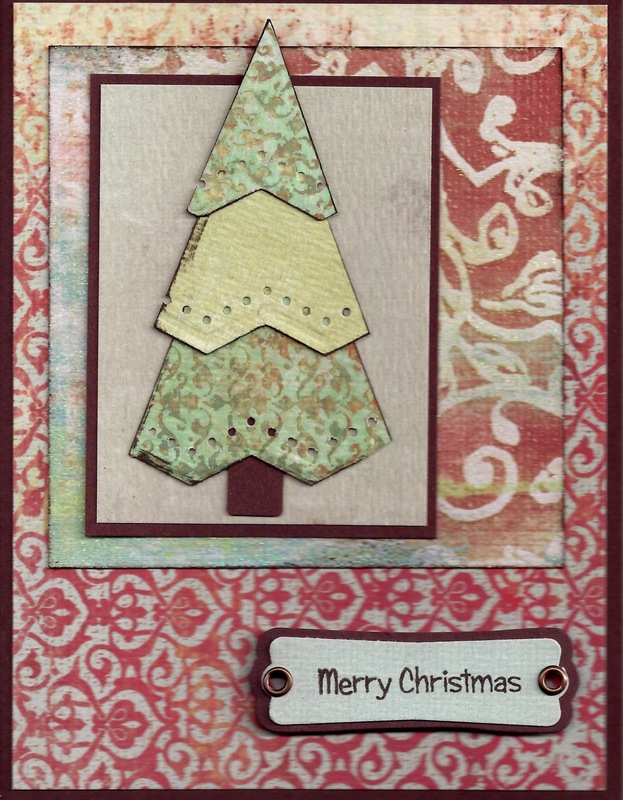 This Christmas tree has been made using Stampin’ Up’s Perfect Pennant Die and Petite Pennant Punch to create three triangles of graduated sizes. 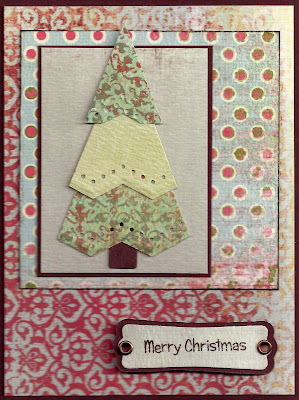 You can create the decorative edges on the three triangular pennants of the tree by using an edge punch of any shape. It’s easier to see what you’re doing if you turn the edge punch upside down. Line up the point of each triangle with the guide line on the edge punch. Repeat for each triangle and glue the tree together. Use the SU mini jewelery punch to create a trunk with the brown cardstock. 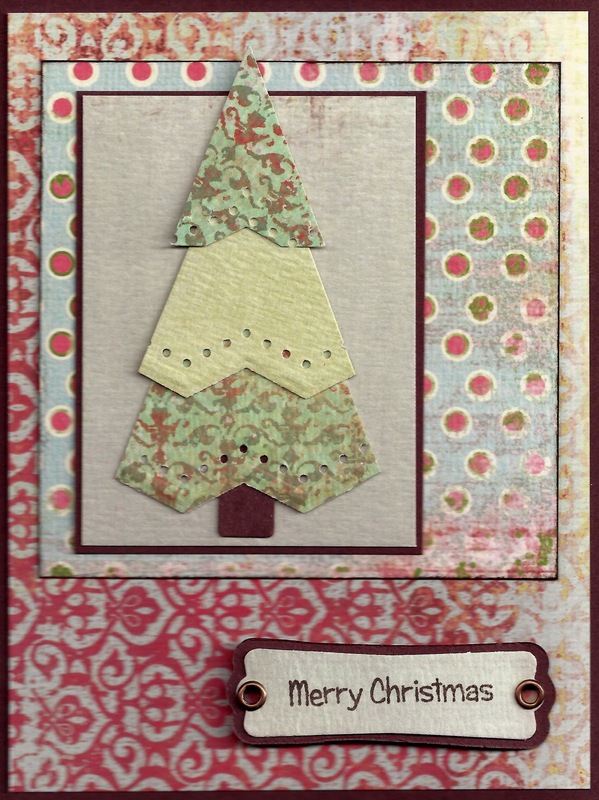 The Merry Christmas tag is created using a SU Modern Label Punch and matching SU Movers & Shapers die. Merry Christmas is stamped in brown ink. Put the two coordinated pieces together. Use an eyelet tool to create holes and insert the eyelets. Begin by stamping the star (from SU The Sounding Joy) in SU Pool Party ink onto Whisper White cardstock. Then overstamp Joy in Cherry Cobbler. 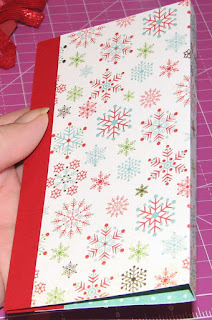 Stick the trimmed Joy/Star onto designer paper and use an edge punch to create accent trims. Create the background of the card by piecing together the two bits of designer cardstock, making one piece slightly bigger than the other. For example, the cards above have one strip 2.75 inches deep versus 1.75 inches. IMPORTANT: Piece these together and then add the ribbon before putting them onto your folded card. This way, the ribbon ends are neatly tucked out of sight. The ribbon between the two pieces serves several functions – it adds an extra dimension and also hides the edges. Circles are a perfect way to create a wreath effect on your Christmas cards. So dig out your circle stamps and circular dies or punches and get creative! Directions: Stamp Holly Jolly Christmas and layer onto Cherry Cobbler paper. Stamp santa onto Whisper White cardstock. Stamp hat in Cherry Cobbler onto Whisper White cardstock. Cut out both. Stamp santa on felt to create outline; cut felt to make a beard and hat trim. Don’t cover up moustache. Don't forget a little round puff for the hat! 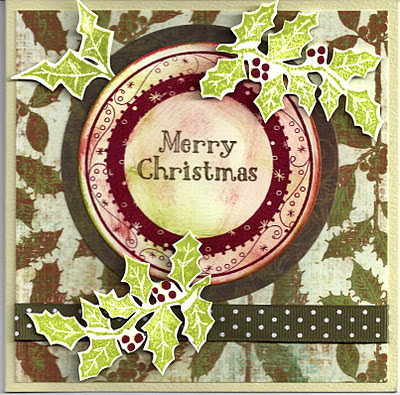 Cut wreath circle from Bigz die. Use white ink pigment ink inside the swirl embossing folder, dragging the colors over the high ridges of the folder. Place the red wreath into the embossing folder and run it through the Big Shot. Weave ribbon into wreath. Put all your pieces togther. The background paper has been adhered to a 4.25-by-5.5-inch white card. The wreath and sentiments are on pop-up adhesives. Directions: Stamp in the Holly Jolly Christmas and layer onto Cherry Cobbler paper. 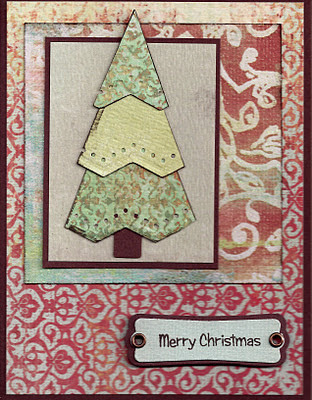 Stamp ornament in Cherry Cobbler ink onto Whisper White cardstock and then punch out. Put all your pieces togther. The background paper has been adhered to a 4.25-by-5.5-inch white card. The ornament and sentiments are on pop-up adhesives.. I've had a bundle of these lovely white paper bags with handles since I first joined Stampin' Up in 2003! Not sure about you, but I have a bad habit of holding onto some of my supplies, waiting for 'just the right project'! However, I know that another big move is in the offing, and I've decided I need to streamline. I've been using up lots of pretty paper and designer cardstock for my rubber stamping classes; and the other day, I decided it was time to liberate some of these bags. During class, the gals each made a bag, which features lots of dies and punches. To start with, we used the sweet Stampin' Up owl punch, which is sitting in an iridescent moon. I also used a Tim Holtz Sizzix house die, which looks great as a silhouette of black haunted houses. A piece of dark blue cardstock was the background, and the star stamp came from SU Jack of All Trades. Pretty black and white ribbon pulls the final look together. Perfect for a Halloween gift bag or trick-or-treat bag to collect candy. 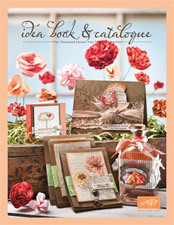 To view the 2011-12 Catalog online, click here. To download a copy of the 2011-12 Catalog, click here (PDF format, 20 MB). If you live in the United Kingdom and would like to order anything from the catalog, please send me an email and I will be happy to help you! The Stampin' Up Sizzlits snowflake dies are fantastic for embellishing Christmas and wintry cards, scrapbook pages, and other paper craft projects. They also work wonderfully as a stand-alone on small 3-by-3-inch gift cards, such as the ones pictured. In addition to the cute little SU Sizzlits snowflakes, I also used the Movers & Shapers snowflake die to create a layered effect. The big snowflake was cut from a very glimmery patterned gold cardstock. You can see that the magnetic Movers & Shapers snowflake die can be moved around in the special metal tray, economically using the cardstock. Pearlescent cardstock was used to create the delicate Sizzlit snowflakes, which then were dabbed with a two-way-glue pen and sprinkled with Dazzling Diamonds. They were glued onto the gold snowflakes, which were applied to the card using pop-up adhesives. I am currently spending the summer in our family's Colorado home. Most of the time, we are spending our time fishing, boating, walking, shopping, and just having lots of fun! As many of the afternoons have been very hot, working on crafts indoors sounds like a wonderful idea! Today, I wanted to make a quick 3x3-inch 'thank-you' card, which you can see above. The problem is, I have very few tools and supplies here at my Colorado hideaway. While my craft space at home in England is literally overflowing and overtaking every corner of the living room, my Colorado craft room has the basic stamp pads, cutting tools, and a handful of rubber stamps (in particular, Christmas stamps). But one thing I do have here is a Big Shot Machine! And, I just bought a few extra dies and supplies the other day. One of the neatest things I purchased is the new Sizzix Tim Holtz Bigz Tray. This special metal tray allows you to take any Movers & Shapers die and use it like a punch. The magnetic Movers & Shapers dies stick to the tray -- in any position you want -- and you can create an art element. So cool! As you can see, I used the tray to create a label and the crown. I used an antique glimmer spray to color the crown. I don't have any rhinestones or jewels in my art stash here, but the crown would look fab with a bit of bling. You then could print out a sentiment for the inside that says something like: You're a gem! Thanks so much!